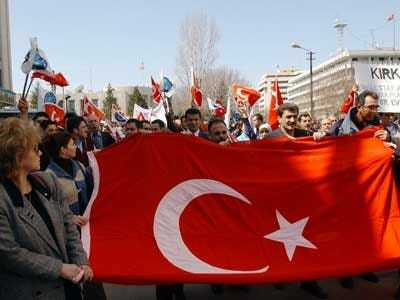 Can Turkey Help Democratize The Middle East? Yet, while nobody in Turkey doubts that all the talk of a Turkish model offers proof of the country’s rapidly growing diplomatic clout, some wonder whether it might not constitute a Trojan horse as far as Turkey’s own still imperfect democracy is concerned. On February 3, Ozel pointed out, a day after supporters of Hosni Mubarak stormed Cairo’s Tahrir Square on camel-back, a crowd peacefully protesting new workplace laws outside Turkey’s parliament in Ankara was tear-gassed and charged baton-charged by riot police. Other analysts think Western talk of a Turkish model is an implicit acknowledgement both of the West’s ambiguous attitude towards democratization in the Muslim world, and its fading ambitions for Turkey. “In the past, Turkey was on an oscillating scale with Europe on one end and the Middle East on the other,” says Fadi Hakura, a specialist on Turkey at Chatham House, a foreign policy think-tank in London. With Turkey’s six-year European Union accession bid now “comatose,” in large part because of European foot-dragging, “Europe has dropped off the continuum,” Hakura says. Some wonder whether Turkey’s transformation over the past decade from a relatively introverted US satellite to a regional leader projecting a new, confident Muslim identity risks inciting authoritarian tendencies that have always been present in its political system. The ideal of “forward democracy” that has been Prime Minister Erdogan’s main slogan since a constitutional referendum last September is based on the idea of a strong economy, a strong party and strong government, not liberal ideals, says Nihal Bengisu Karaca, a columnist with the daily Haberturk.